Fictional setting: In 1993 the first instalment of Steven Spielberg’s Jurassic sci-fi saga was released. In Jurassic Park, the eponymous theme park suffers a malfunction which results in the terrifying escape of its main attractions; the cloned dinosaurs created in its laboratories. Although the park’s fictional location of Isla Nublar is said to be near Costa Rica, it was actually Hawaii that served as the setting for the majority of the film’s shooting, and the Garden of Eden Arboretum and Botanical Garden makes an appearance in the opening sequence of the film. True location: The same characteristic vistas seen at the beginning of the film can be viewed at the botanical garden, which is located along the scenic Hana Highway in Maui. 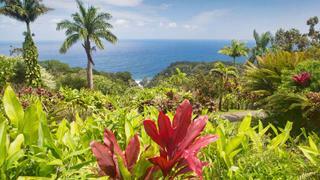 The entire park is bursting with beautiful and rare botanical specimens indigenous to the island, including a century-old mango tree and the largest collection of purple Ti plants. The highlight, however, is the lookout point, which features the distinctive Keopuka “Jurassic” Rock. Nearby: Maalaea Bay on the west side of the island provides a sheltered anchorage to base at overnight, in addition to the anchorage off Lahaina. While you are visiting the island you can also see the impressive dormant volcano Haleakala, and visitors should explore the rest of Hawaii for once-in-a-lifetime adventures. Fictional setting: In 1993 the first instalment of Steven Spielberg’s Jurassic sci-fi saga was released. In Jurassic Park, the eponymous theme park suffers a malfunction which results in the terrifying escape of its main attractions; the cloned dinosaurs created in its laboratories. Although the park’s fictional location of Isla Nublar is said to be near Costa Rica, it was actually Hawaii that served as the setting for the majority of the film’s shooting, and the Garden of Eden Arboretum and Botanical Garden makes an appearance in the opening sequence of the film. True location: The same characteristic vistas seen at the beginning of the film can be viewed at the botanical garden, which is located along the scenic Hana Highway in Maui. The entire park is bursting with beautiful and rare botanical specimens indigenous to the island, including a century-old mango tree and the largest collection of purple Ti plants. The highlight, however, is the lookout point, which features the distinctive Keopuka “Jurassic” Rock. Nearby: Maalaea Bay on the west side of the island provides a sheltered anchorage to base at overnight, in addition to the anchorage off Lahaina. While you are visiting the island you can also see the impressive dormant volcano Haleakala, and visitors should explore the rest of Hawaii for once-in-a-lifetime adventures. Fictional setting: In the 1995 film Bad Boys, starring Will Smith as Mike Lowrey, and Martin Lawrence as Marcus Burnett, who play two policemen on the hunt for drugs stolen from a police vault. Two of Lowrey's informants, Maxine and Julie, head to a party to search for clues, but the event goes south and Julie has to escape by jumping into the swimming pool. True location: The party was filmed at historical landmark The Biltmore Hotel Miami in Coral Gables, which has also been a filming location for CSI: Miami and Miami Vice, among many others. Originally built in the 1920s, it was once a hub of celebrity activity, boasting guests such has Judy Garland, Bing Crosby and Ginger Rogers. 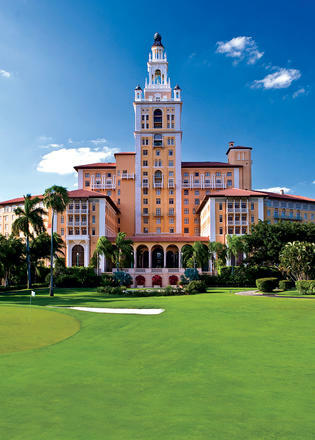 Now one of Miami's most prestigious and luxurious hotels, the Biltmore boasts a state-of-the-art golf course, one of the largest swimming pools in America, a culinary academy and a luxurious spa. Additionally, guests can go on boat excursions to the Everglades, a UNESCO World Heritage Site. Nearby: There are a myriad of superyacht marinas in Miami, a list that includes Island Gardens Deep Harbour, which can host yachts up to 167 metres. Fictional setting: In the 1995 film Bad Boys, starring Will Smith as Mike Lowrey, and Martin Lawrence as Marcus Burnett, who play two policemen on the hunt for drugs stolen from a police vault. Two of Lowrey's informants, Maxine and Julie, head to a party to search for clues, but the event goes south and Julie has to escape by jumping into the swimming pool. True location: The party was filmed at historical landmark The Biltmore Hotel Miami in Coral Gables, which has also been a filming location for CSI: Miami and Miami Vice, among many others. Originally built in the 1920s, it was once a hub of celebrity activity, boasting guests such has Judy Garland, Bing Crosby and Ginger Rogers. Now one of Miami's most prestigious and luxurious hotels, the Biltmore boasts a state-of-the-art golf course, one of the largest swimming pools in America, a culinary academy and a luxurious spa. Additionally, guests can go on boat excursions to the Everglades, a UNESCO World Heritage Site. Nearby: There are a myriad of superyacht marinas in Miami, a list that includes Island Gardens Deep Harbour, which can host yachts up to 167 metres. Fictional setting: The action-packed movie Kong: Skull Island uses Hạ Long Bay as a prominent role in the new movie, where a secret organisation discovers a mysterious island that is described as the origin of new species. True location: In reality, the island is the northern region of Vietnam. In addition to Hạ Long Bay in the Quảng Ninh Province, filming took place in Tam Cốc, Tràng An, Vân Long and at the entrance of Tú Làn Caves. Nearby: Hạ Long Bay is best seen by boat and visitors can take a one, two or three night charter on board a private luxury junk boat from Hạ Long Harbour. Make sure to stop off at as many of the secret lagoons, deep-set caves and quiet beaches as possible while exploring this extraordinary part of Vietnam. Fictional setting: The action-packed movie Kong: Skull Island uses Hạ Long Bay as a prominent role in the new movie, where a secret organisation discovers a mysterious island that is described as the origin of new species. True location: In reality, the island is the northern region of Vietnam. In addition to Hạ Long Bay in the Quảng Ninh Province, filming took place in Tam Cốc, Tràng An, Vân Long and at the entrance of Tú Làn Caves. 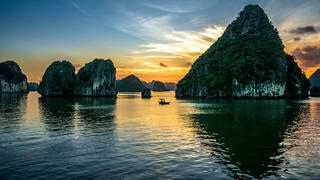 Nearby: Hạ Long Bay is best seen by boat and visitors can take a one, two or three night charter on board a private luxury junk boat from Hạ Long Harbour. Make sure to stop off at as many of the secret lagoons, deep-set caves and quiet beaches as possible while exploring this extraordinary part of Vietnam. Fictional setting: In the second film of the Pirates of the Caribbean series Jack Sparrow visits the voodoo priestess Tia Dalma’s wooden shack in the hope she will help with his quest to secure the Dead Man’s Chest. A series of trades leaves Jack knowing the location of the Flying Dutchman but later it transpires she had not been as helpful as first thought. 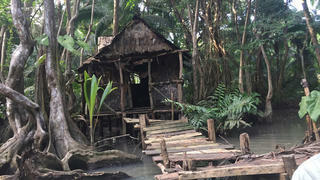 True location: Not nearly as eerie if visited in daylight the wooden hut still remains on the bank of the Indian River in Dominica. No motor boats are allowed on the river so go on a rowing boat tour and make sure you stop off at Cobra's Bush Bar and Botanical Gardens, one of the most iconic yachty watering holes. 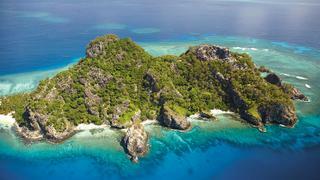 Nearby: There are no superyacht marinas in Dominica but one of the nicest anchorages is in nearby Rupert’s Bay. From there you can tender in to meet your rowing boat or to any of Dominica’s numerous other inland attractions. Fictional setting: In the second film of the Pirates of the Caribbean series Jack Sparrow visits the voodoo priestess Tia Dalma’s wooden shack in the hope she will help with his quest to secure the Dead Man’s Chest. A series of trades leaves Jack knowing the location of the Flying Dutchman but later it transpires she had not been as helpful as first thought. True location: Not nearly as eerie if visited in daylight the wooden hut still remains on the bank of the Indian River in Dominica. No motor boats are allowed on the river so go on a rowing boat tour and make sure you stop off at Cobra's Bush Bar and Botanical Gardens, one of the most iconic yachty watering holes. Nearby: There are no superyacht marinas in Dominica but one of the nicest anchorages is in nearby Rupert’s Bay. From there you can tender in to meet your rowing boat or to any of Dominica’s numerous other inland attractions. Fictional Setting: The 1988 film Cocktail starring Tom Cruise sees Brian Flanagan jet off to sunny Jamaica to work as a bartender with the hope of earning enough to buy his own establishment. 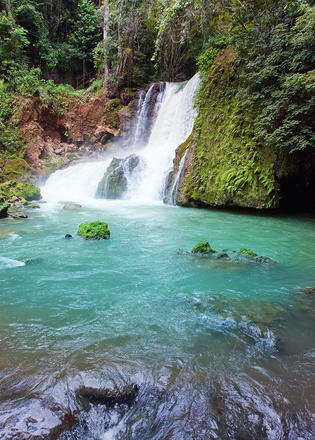 True Location: The north shore of Jamaica was used for a great deal of filming — specific locations include Port Antonio, Dunn's River Falls and Sandals Royal Plantation in Ocho Rios. Nearby: This stunning Caribbean Island has numerous sandy bays, clear waters and a host of luxury offerings, including the Red Lane Spa at Sandals Royal Plantation where you can unwind with a tropical massage. If you're looking to explore Port Antonio, Frenchman's Cove is a lovely spot that has great snorkelling and even better piña coladas. Additionally, the Blue Mountains National Park is just a short distance away for anyone keen to go hiking for some incredible views — it's the perfect day trip for anyone embarking on a private vacation or a luxury yacht charter to Jamaica. Fictional Setting: The 1988 film Cocktail starring Tom Cruise sees Brian Flanagan jet off to sunny Jamaica to work as a bartender with the hope of earning enough to buy his own establishment. True Location: The north shore of Jamaica was used for a great deal of filming — specific locations include Port Antonio, Dunn's River Falls and Sandals Royal Plantation in Ocho Rios. Nearby: This stunning Caribbean Island has numerous sandy bays, clear waters and a host of luxury offerings, including the Red Lane Spa at Sandals Royal Plantation where you can unwind with a tropical massage. If you're looking to explore Port Antonio, Frenchman's Cove is a lovely spot that has great snorkelling and even better piña coladas. Additionally, the Blue Mountains National Park is just a short distance away for anyone keen to go hiking for some incredible views — it's the perfect day trip for anyone embarking on a private vacation or a luxury yacht charter to Jamaica. Fictional Setting: Though the bridge was blown up in a confrontation between Arnold Schwarzenegger and a terrorist group known as the Crimson Jihad in 1993 action movie True Lies, it has also featured in other TV series and movies such as I Am Number Four, Licence to Kill, 2 Fast 2 Furious, Mission Impossible III, Burn Notice, and Leverage. 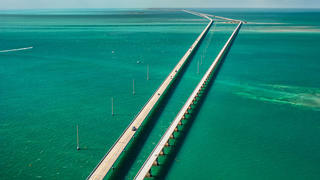 True location: The Seven Mile Bridge is part of the Overseas Highway, one of the best coastal roads to drive, which connects Florida to the islands of Florida Keys. Nearby: Superyachts can anchor at Key West or moor at one of the marinas in Miami — Island Gardens Deep Harbour can berth yachts up to 167 metres. From either end take a private limousine to enjoy the long but stunning drive along the Overseas Highway and stop at a handful of the marvellous beachside restaurants and cafés en route. Fictional Setting: Though the bridge was blown up in a confrontation between Arnold Schwarzenegger and a terrorist group known as the Crimson Jihad in 1993 action movie True Lies, it has also featured in other TV series and movies such as I Am Number Four, Licence to Kill, 2 Fast 2 Furious, Mission Impossible III, Burn Notice, and Leverage. True location: The Seven Mile Bridge is part of the Overseas Highway, one of the best coastal roads to drive, which connects Florida to the islands of Florida Keys. Nearby: Superyachts can anchor at Key West or moor at one of the marinas in Miami — Island Gardens Deep Harbour can berth yachts up to 167 metres. From either end take a private limousine to enjoy the long but stunning drive along the Overseas Highway and stop at a handful of the marvellous beachside restaurants and cafés en route. Fictional setting: In this iconic Stephen King adaptation, Andy Dufresne and Ellis ‘Red’ Redding become friends during a horrific stint in Shawshank State Penitentiary. Andy’s plan is to escape and head to Mexico, much to the disbelief of Red: “You shouldn't be doing this to yourself…Mexico is way down there and you're in here... and that's the way it is.” True Location: In reality, the sunny Zihuatanejo beach in Mexico was actually filmed in the Sandy Point National Wildlife Refuge on the south west tip of St Croix, the largest of the US Virgin Islands. The two mile stretch of golden sand is a hatching ground to leatherback turtles so is only open at limited times, but it’s so beautiful it’s well worth the trip as it's one of the best beaches in the Caribbean. Nearby: Just north of Sandy Point National Wildlife Refuge lies Frederiksted Pier, a great spot of snorkelling and diving. Additionally the St George Village Botanical Gardens are just a short drive away. Head towards the east of the island you’ll find the vibrant town of Christiansted, where the King’s Wharf offers plenty of shopping opportunities. Discovering the US Virgin Islands on a superyacht is the perfect way to explore this beautiful Caribbean spot. True Location: In reality, the sunny Zihuatanejo beach in Mexico was actually filmed in the Sandy Point National Wildlife Refuge on the south west tip of St Croix, the largest of the US Virgin Islands. The two mile stretch of golden sand is a hatching ground to leatherback turtles so is only open at limited times, but it’s so beautiful it’s well worth the trip as it's one of the best beaches in the Caribbean. Nearby: Just north of Sandy Point National Wildlife Refuge lies Frederiksted Pier, a great spot of snorkelling and diving. Additionally the St George Village Botanical Gardens are just a short drive away. Head towards the east of the island you’ll find the vibrant town of Christiansted, where the King’s Wharf offers plenty of shopping opportunities. Discovering the US Virgin Islands on a superyacht is the perfect way to explore this beautiful Caribbean spot. Fictional setting: The lighthouse is one stop off during Forrest Gumps’ “very long run” in the 1994 classic. Gump runs down the long wooden gangway to the lighthouse before deciding “having got this far he might as well keep on going”. True location: Unusually for movie locations the film was shot at Marshall Point in Maine. Located near the fishing village of Port Clyde there is also a museum on site, part of which documents the filming of the movie. Nearby: The Maine Coastline extends more than 3,400 miles and has more than 4,000 islands so is perfect to explore by superyacht. Try and time your visit to coincide with the Rockland, Maine Lobster Festival (August 3-7). Fictional setting: The lighthouse is one stop off during Forrest Gumps’ “very long run” in the 1994 classic. Gump runs down the long wooden gangway to the lighthouse before deciding “having got this far he might as well keep on going”. 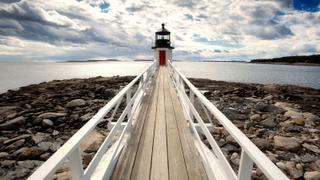 True location: Unusually for movie locations the film was shot at Marshall Point in Maine. Located near the fishing village of Port Clyde there is also a museum on site, part of which documents the filming of the movie. Nearby: The Maine Coastline extends more than 3,400 miles and has more than 4,000 islands so is perfect to explore by superyacht. Try and time your visit to coincide with the Rockland, Maine Lobster Festival (August 3-7). Fictional setting: The climactic scene of Star Wars Episode VIII The Force Awakens is set on an island where the remains of the First Jedi Temple lies. True location: In reality, the filming location is much more down to earth but no less mystical. 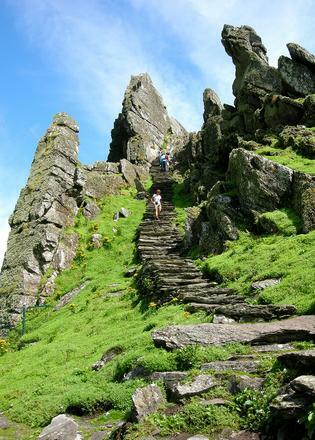 The world heritage site of Skellig Michael, seven miles off the western Irish coast, was once an ancient monastery and is still home to archaeological remains. Local press reported that the producers were so grateful for using the dramatic location that they made a sizeable donation to the Royal National Lifeboat Institution (RNLI). Nearby: The rock is approximately 45-minutes from Kerry or alternatively you can organise a helicopter tour to take in the island from above. The west coast of Ireland may not be the easiest destination to visit by superyacht but for the true Star War’s aficionado is could be a worthwhile pilgrimage. Fictional setting: The climactic scene of Star Wars Episode VIII The Force Awakens is set on an island where the remains of the First Jedi Temple lies. True location: In reality, the filming location is much more down to earth but no less mystical. The world heritage site of Skellig Michael, seven miles off the western Irish coast, was once an ancient monastery and is still home to archaeological remains. Local press reported that the producers were so grateful for using the dramatic location that they made a sizeable donation to the Royal National Lifeboat Institution (RNLI). Nearby: The rock is approximately 45-minutes from Kerry or alternatively you can organise a helicopter tour to take in the island from above. The west coast of Ireland may not be the easiest destination to visit by superyacht but for the true Star War’s aficionado is could be a worthwhile pilgrimage. Fictional setting: Some of James Bond’s most spectacular underwater brawls take place in 1965 Sean Connery instalment Thunderball. Much of the film is set around Nassau in the Bahamas, including scenes in which Bond grapples with villain Largo’s henchmen in an extraordinary series of submerged caves. 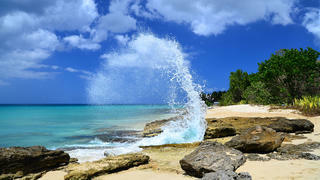 True location: The spot, near Staniel Cay, was renamed Thunderball Grotto after the film. The island itself looks unassuming, but hold your breath and swim beneath an overhang of rocks, and you’ll emerge into a massive secret cavern. Fish will eat bread out of your hand and the snorkelling is spectacular. Staniel Cay is just one of many James Bond locations you can visit on a superyacht. Nearby: Staniel Cay Yacht Club takes yachts of up to 56 metres and has one the best iconic yachtie watering holes. Fictional setting: Some of James Bond’s most spectacular underwater brawls take place in 1965 Sean Connery instalment Thunderball. Much of the film is set around Nassau in the Bahamas, including scenes in which Bond grapples with villain Largo’s henchmen in an extraordinary series of submerged caves. True location: The spot, near Staniel Cay, was renamed Thunderball Grotto after the film. The island itself looks unassuming, but hold your breath and swim beneath an overhang of rocks, and you’ll emerge into a massive secret cavern. Fish will eat bread out of your hand and the snorkelling is spectacular. Staniel Cay is just one of many James Bond locations you can visit on a superyacht. Nearby: Staniel Cay Yacht Club takes yachts of up to 56 metres and has one the best iconic yachtie watering holes. Fictional setting: Baz Lurhmann’s 2013 adaptation takes place among the fictional Long Island beach communities of East Egg and West Egg. The houses, landscapes and cars are pure Americana – even the historical period itself is linked to this location, which thanks to the book’s fame, feels like the Roaring Twenties’ loudest corner. True location: Lurhmann filmed in… Sydney; Gatsby’s Long Island mansion was in fact The Manly Business School, for example. The substitution makes sense culturally: Sydney’s booming economy, pretty young things, new social scenes and smart beach towns echo Fitzgerald’s setting – perhaps more than 21st century Long Island. Nearby: Sydney’s early 20th century architecture lends itself to speakeasy bars: try Palmer & Co and The Baxter Inn. Sydney Superyacht Marina at Rozelle near the CBD takes yachts up to 70 metres. Spit Marina is also undergoing an expansion to attract superyachts. Fictional setting: Baz Lurhmann’s 2013 adaptation takes place among the fictional Long Island beach communities of East Egg and West Egg. The houses, landscapes and cars are pure Americana – even the historical period itself is linked to this location, which thanks to the book’s fame, feels like the Roaring Twenties’ loudest corner. True location: Lurhmann filmed in… Sydney; Gatsby’s Long Island mansion was in fact The Manly Business School, for example. The substitution makes sense culturally: Sydney’s booming economy, pretty young things, new social scenes and smart beach towns echo Fitzgerald’s setting – perhaps more than 21st century Long Island. Nearby: Sydney’s early 20th century architecture lends itself to speakeasy bars: try Palmer & Co and The Baxter Inn. Sydney Superyacht Marina at Rozelle near the CBD takes yachts up to 70 metres. Spit Marina is also undergoing an expansion to attract superyachts. Fictional setting: In Anthony Minghella’s 1999 film, the charisma of Jude Law’s rich kid Dickie Greenleaf is inextricable from the fictitious Italian resort of Mongibello. He pops into jazz clubs, lounges on the beach and has trysts on yachts. If he’d idled somewhere less romantic, Matt Damon’s poor jealous Tom Ripley may have felt less inclined to bonk him on the head with an oar. True location: Procida, in the Bay of Naples, stood in for most of Mongibello. Off the mass tourist trail, the pretty island has ice cream-coloured houses, winding alleys and lemon groves. Glamorous Ischia also features and is nearby. 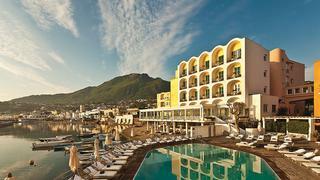 Nearby: The Albergo della Regina Isabella on Ischia is a gorgeous hotel on the water. Marina di Capri is 19 miles south east and Marina Molo Luise, in Naples, a little closer. Fictional setting: In Anthony Minghella’s 1999 film, the charisma of Jude Law’s rich kid Dickie Greenleaf is inextricable from the fictitious Italian resort of Mongibello. He pops into jazz clubs, lounges on the beach and has trysts on yachts. If he’d idled somewhere less romantic, Matt Damon’s poor jealous Tom Ripley may have felt less inclined to bonk him on the head with an oar. True location: Procida, in the Bay of Naples, stood in for most of Mongibello. Off the mass tourist trail, the pretty island has ice cream-coloured houses, winding alleys and lemon groves. Glamorous Ischia also features and is nearby. Nearby: The Albergo della Regina Isabella on Ischia is a gorgeous hotel on the water. Marina di Capri is 19 miles south east and Marina Molo Luise, in Naples, a little closer. Fictional setting: In Danny Boyle’s film Leonardo DiCaprio’s character Richard finds the eponymous beach Treasure Island-style, using a mysterious map – and his prize is the perfect sweep of sand. 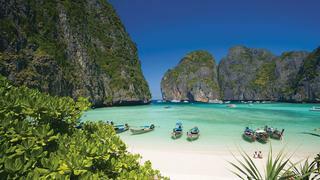 True location: Ao Maya Bay on Ko Phi Phi Leh is indeed jaw-droppingly beautiful, on a luminous lagoon surrounded by towering cliffs – and it is easier to find than the film implies. There may be choppier seas in May and October, but it will be quieter. Nearby: Stay on the yacht and enjoy some of the world's best dives. About 30 miles north west is Royal Phuket Marina. Fictional setting: In Danny Boyle’s film Leonardo DiCaprio’s character Richard finds the eponymous beach Treasure Island-style, using a mysterious map – and his prize is the perfect sweep of sand. True location: Ao Maya Bay on Ko Phi Phi Leh is indeed jaw-droppingly beautiful, on a luminous lagoon surrounded by towering cliffs – and it is easier to find than the film implies. There may be choppier seas in May and October, but it will be quieter. Nearby: Stay on the yacht and enjoy some of the world's best dives. About 30 miles north west is Royal Phuket Marina. Filming location for Mamma Mia! Fictional setting: The 2008 musical based around Abba numbers is set on the fictional Greek island of Kalokairi. The hot, dusty island, with its whitewashed houses and bougainvillea, sums up the romance of the Greek islands. True location: Most of Mamma Mia! was filmed on the Greek Sporades islands of Skopelos and Skiathos. Skopelos, more rugged and less developed, boasts fabulous beaches: Glysteri, a gorgeous protected cove with translucent-green waters and Kastani, a cliff-backed slip of sand to the west. Nearby: The Adrina Resort & Spa on Skopelos has a rooftop restaurant with spectacular views. Skiathos Marina in Skiathos town takes yachts of up to 65 metres. Fictional setting: The 2008 musical based around Abba numbers is set on the fictional Greek island of Kalokairi. The hot, dusty island, with its whitewashed houses and bougainvillea, sums up the romance of the Greek islands. True location: Most of Mamma Mia! was filmed on the Greek Sporades islands of Skopelos and Skiathos. Skopelos, more rugged and less developed, boasts fabulous beaches: Glysteri, a gorgeous protected cove with translucent-green waters and Kastani, a cliff-backed slip of sand to the west. Nearby: The Adrina Resort & Spa on Skopelos has a rooftop restaurant with spectacular views. 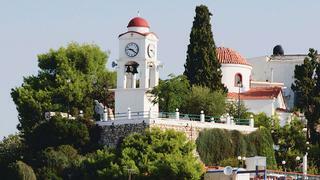 Skiathos Marina in Skiathos town takes yachts of up to 65 metres. Fictional setting: The anonymous South Pacific island in Robert Zemeckis’s 2000 film is a villain, crushing the sanity of Tom Hanks’s crash-stranded character. He has lonely crab barbecues on its powder-sand beach, finds a corpse in the turquoise shallows and tries to hang himself from a spectacular mountain. True location : If you visit Monuriki for any reason other than a plane crash, it is rather lovely, with lagoons, pine forests, a 178 metre peak to climb, turtles and a teeming coral reef. Nearby : The island resort of Matamanoa is a mile south; the Yava Spa Pedicure with lime, lavender and coconut cream will soothe Robinson Crusoe feet. Port Denarau Marina, Fiji’s only superyacht facility, is about 25 miles east. Fictional setting: The anonymous South Pacific island in Robert Zemeckis’s 2000 film is a villain, crushing the sanity of Tom Hanks’s crash-stranded character. He has lonely crab barbecues on its powder-sand beach, finds a corpse in the turquoise shallows and tries to hang himself from a spectacular mountain. True location : If you visit Monuriki for any reason other than a plane crash, it is rather lovely, with lagoons, pine forests, a 178 metre peak to climb, turtles and a teeming coral reef. Nearby : The island resort of Matamanoa is a mile south; the Yava Spa Pedicure with lime, lavender and coconut cream will soothe Robinson Crusoe feet. Port Denarau Marina, Fiji’s only superyacht facility, is about 25 miles east.